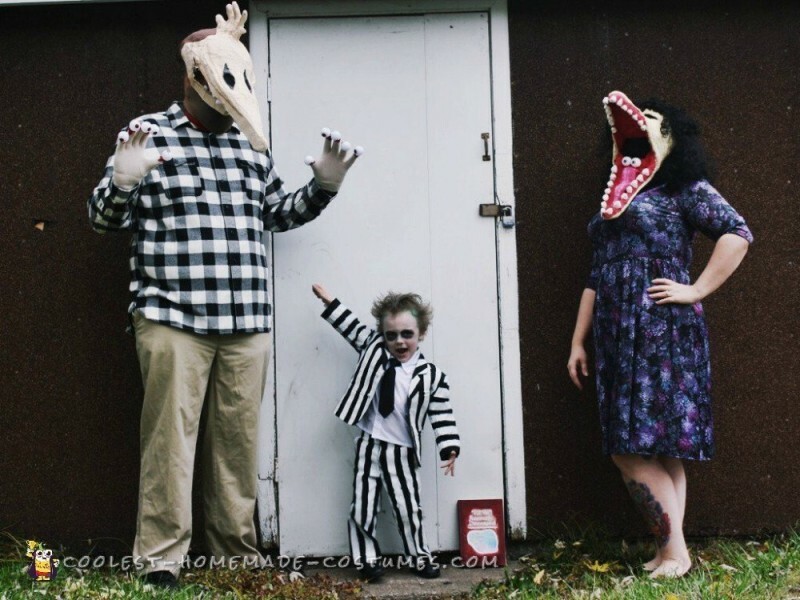 This is my little family in our homemade Beetlejuice character costumes. 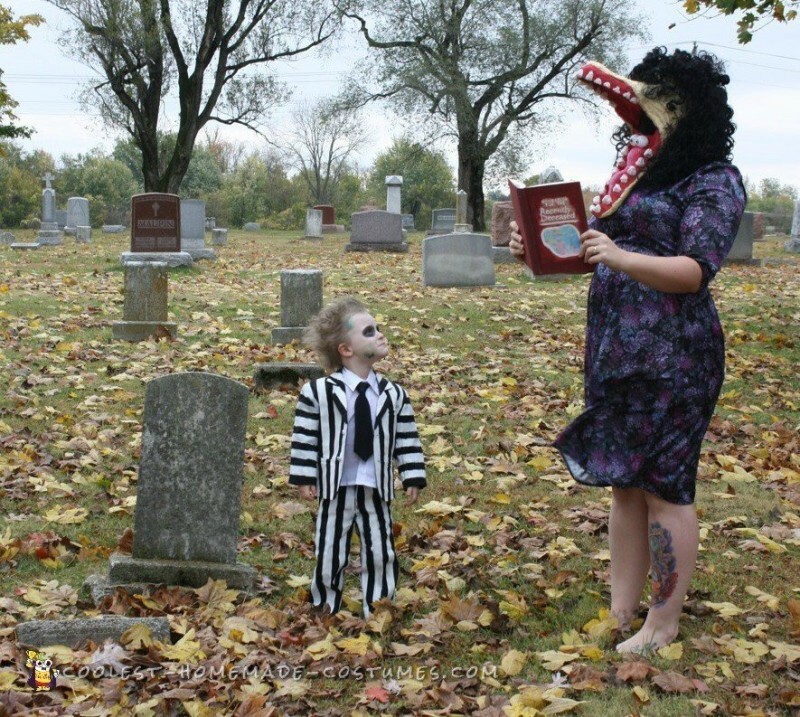 I originally got this idea by searching though homemade costumes online (and our love for Beetlejuice). For the Adam and Barbara Maitland masks I found a few how-to references through Google. I put parts of the tutorials together to make them. They started off with wire coat hangers and a hat. I then used paper mache, some acrylic paint, $1 store plastic eyes, felt for Adam’s teeth and hair, and a wig for Barbara. This whole process took over a week between dry times. I ended up using something call paper mache clay. It inclues joint compound and toilet paper. I left enough room for my face to be able to see. Adam’s ended up being a little more difficult to see out of. We both wore pantyhose over our faces, mine black and my husband’s a beige color (I was trying to hide his beard as best I could). I hot glued eyes onto a pair of gloves. I thrifted all the clothes besides Adam’s shirt which was from Target. I put it all together and there you go! The Maitlands! 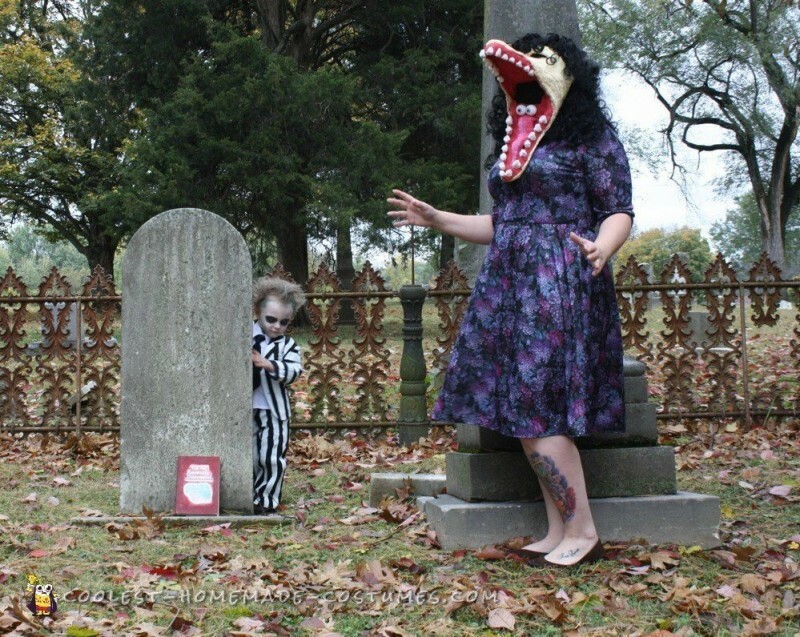 The Beetlejuice costume was made from my son’s suit that he wore to our wedding this summer. I painted the suit with acrylic paint and help from masking tape. It took two coats. I used white face paint with some black and green eyeshadow. I added a little moss adhered with eyelash glue. Lastly, I used an old book, painted it dark red and printed out “the handbook for the recently deceased” pdf I found online. I then used mod podge to adhere the image onto the book. We had a blast wearing these costumes! 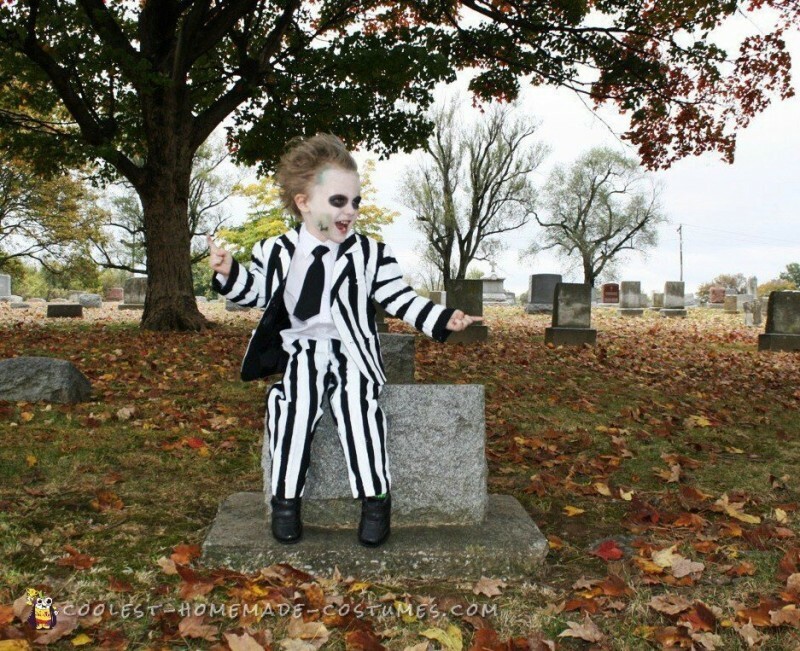 We found out last year when we dressed our son as Edward scissorhands that people LOVE Tim Burton. My son especially loved the attention we got in these costumes. He wasn’t shy to share the quotes we had been teaching him. 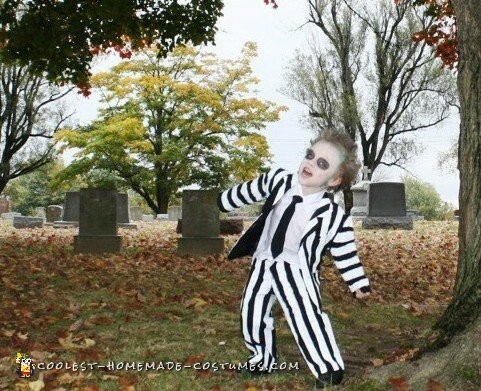 He has the Beetlejuice attitude down – IT’S SHOWTIME!